Somewhat Serious Analysis and Reviews of Silly Sci-Fi and Comedy… Mostly. Synopsis: The moon that provides the Klingon Empire’s energy suffers a major disaster, releasing ozone onto the planet. This potentially condemns the empire to a maximum of fifty years, should the planet not reign in it’s military expenditures. The Federation is ready to broker a treaty between them and the empire, and sends Captain James T Kirk and the Enterprise out to make a truce. Thing is, Kirk doesn’t trust the Klingons – something about them stabbing his son and wrecking his old ship doesn’t endear them to him. Just after a series of awkward talks between the Klingon Ambassadors and the Enterprise (appointed ambassadors), the latter ship fires on the former’s ship, killing the Klingon Chancellor. With no knowledge of who did it, Kirk and Dr. McCoy stand trial and face life in prison, and the two forces appear on the brink of war. Review: Well, it took far longer than I expected (again, my apologies), but here we are. The last movie solely based off of Star Trek: The Original Series, and the last film produced during Gene Roddenberry’s lifetime (he died a month and a half before the premiere, but got an advance screening two days before he died). After the utter disaster that was Star Trek V, nobody was sure what to do with Star Trek VI. In fact, if it wasn’t for the fact that it was the franchise’s 25th anniversary, and that TNG had done alright in the ratings so far, Paramount probably would’ve sunk Star Trek into history. After waffling around as to what the plot would be, the end result is actually a genuinely moving film – an arguably overlooked classic in the Trek canon. Let’s just put this in perspective: when TOS premiered, the biggest band in the world was The Beatles, part of the British Invasion; a member of the UK Parliament by the name of Margaret Hilda Thatcher was but an ex-cabinet minister, spending time on the opposition backbenches; and USSR, led by Leonid Brezhnev, was competing for the most powerful nation in the world. By the time this movie premiered, Nirvana put Grunge in the mainstream, Former Prime Minister Thatcher had (controversially) turned Britain into a powerful market economy (and had served as the first Prime Minister with a science degree), and the Soviet Union was caving in on itself. In fact, that last note is poignant for two reasons. First, a mere two days after The Undiscovered Country premiered, three of the Soviet Union’s main “countries” – Russia, Ukraine, and Belarus – signed a decree delivering a mortal blow to the rapidly-dying USSR; Chancellor Mikhail Gorbachev would resign as the head of the dead nation on Christmas. Second, the entire plot of this movie is but a mere allegory of the detente in relations between Gorbachev and President Reagan, or at least, the resistance to said detente. Hardliners on both the Klingon and the Federation fronts don’t want any sort of treaty – they’re willing to start a war just to eliminate the other side. But for what? Simply to fill their own prejudices, to fuel their own distrust of the other. The effects could only be cyclical and result in a sense of mutually aided destruction. An argument could be made that this was an allegory of President Reagan’s initial position on the “evil empire”, as he put it – he proposed the Strategic Defense Initiative, a complex program that would destroy potential missiles in outer space. He came around, though, establishing decent relations with the more moderate Gorbachev. The feeling, though was felt on the other side of the curtain in 1991 – the August Coup D’etat was an attempt to hold Gorbachev hostage for three days by hardline Communists. It fell apart, and the party was banned within days. Beyond politics, though, there’s some sort of reflection that, in a way, maybe the USSR and the USA weren’t that different. Sure, one preached capitalism and democracy, the other, communism and autocracy. Here, we get this through the borderline xenophobic rhetoric that each of the societies possess. In particular, we get a look at the somewhat bellicose attitude of some elements in the Federation – a stand-in for the Western nations. Kirk, in particular, saw the worst of these tendencies when a rogue Klingon stabbed his son, forced him to blow his ship to kingdom come, and was willing to die rather than be saved by the man. It is sobering, in a sense, to see the long-term effects of this – “Let them die!” There is a method to his madness, but the movie doesn’t do anything to justify his bigotry. However, it only serves to continue the pain, as his words adversely affect his future, as well as that of the Klingons. Obviously, Kirk’s views don’t represent the views of the Federation. But with him being the primary diplomat and, to many, the face of Starfleet, the askance keeps on coming from both sides of the fence. It’s a toxic reflection on how stereotypes and grudges, no matter what their Genesis, keep holding progress back. It’s all a part of the human condition, something we must improve on. Of course, there’s much more to the movie than just the Cold War Allegory. Star Trek VI is, at its heart, a mystery. How cliche the plot could be, I don’t know, given that I’m not a huge mystery movie fan, but honestly, it’s execution is so earnest and so fun, that if it is tried-and-true, I’m gonna let it slide. This movie also serves as the grand finale of the TOS crew, as previously noted. Having seen them develop over the past 25 years, this movie sends them out with a bang – every member is tied in with the mystery, everyone puts the pieces of the puzzle together. This is aided by the previous installments, though… well, at least four of the previous five movies. Still, to think that what was once a crew out on a five-year voyage became so devoted and close to each other that they would go to the ends of the universe to save their captain – it really does feel more like a friendship than merely saving their superior officer. Leonard Nimoy, as always, puts in a stellar performance as Mr. Spock. His look of shock when he finds out one of the conspirers in the assassination is not only convincing but also helps to show just how much Mr. Spock has become a more nuanced, complex character than people tend to give him credit for. Nothing over the top – just shock and disappointment. We wouldn’t expect anything less from Mr. Nimoy. General Chang is an interesting villain. Christopher Plummer puts in a Shakespearian performance – literally. The movie had a lot of Shakespeare quotes, and it helps to show that Chang has a knowledge of Earth culture, even if he disagrees with it to the point of sabotaging the peace talks between the two empires. I don’t think he’s as memorable as Khan, but we still have a pretty good antagonist. Credit goes to the rest of the cast, as well. Shatner, Nichols, Kelley, Koenig, Michael Dorn… everyone has fun with the script they have. Even with Shatner hamming it up a little, it’s still enjoyable to watch – because the script is so good. And that’s what makes this movie so good. Beyond its allegory, it’s mystery, it’s acting, it’s just a fun celebration of The Original Series. I’d even go as far as to say that it’s as close in spirit to TOS than any other movie. That’s not a knock on those movies, but this feels like a very good two-parter episode. A very good two-parter episode, showing an optimistic future for the world. “Some people think the future means the end of history. Well, we haven’t run out of history quite yet.” Indeed, the end might be nigh for the crew, but Star Trek will always have a future. We might fear the world is at an end, but we really don’t know that. Who knows what consequences our decisions may have, on an individual or a societal scale. It’s ironic how The Final Frontier was more ambitious, yet ultimately less cohesive, than the relatively conservative and fun Undiscovered Country. What else can I say but… what a finale for the crew. This film was actually conceived as a “how they met” flick, showing Kirk and Spock at Starfleet Academy. Already controversial from the fanbase, that, plus the relative underperformance of the prior movie, caused the producers to pull back. Eighteen years after this movie premiered, JJ Abrams executed the original idea in Trek 2009. 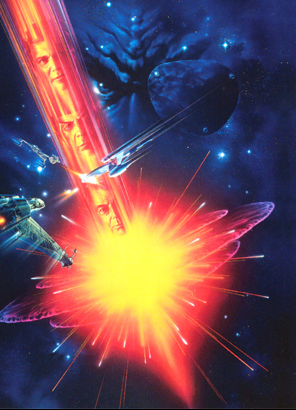 Nicholas Meyer came back to direct Trek VI, and even wrote the screenplay. He actually wrote the draft of Wrath of Khan, but didn’t get credit. In hindsight, it’s amazing how every Trek movie does flow into each other. Even The Final Frontier, weak as it is, does provide something of a preamble to the detente in relations between the Federation and the Klingons. Lots of Shakespeare quotes here, especially from Chang. Most of them are fantastic, added in in such a fun fashion. The twist involving Valeris’ role in the assassination was indeed a bit of an interesting twist, but it could’ve been more shocking – Gene Roddenberry was firmly opposed to the idea of Saavik being a traitor. Speaking of which, this movie was dedicated to the Great Bird of the Galaxy himself. Say what you will about him, but without Mr. Roddenberry, Trek wouldn’t have even seen daylight. And without Star Trek, who knows if we would’ve gotten shows like Red Dwarf and Steven Universe. Thanks, Gene. Oh, yeah, this movie won the Saturn Award. Yes, the Saturn Award. The only Trek movie to do so. Favorite Scene: Spock’s mind-meld with Valeris. The acting sells just how sobering the scene actually is, and showcases the oft-ignored emotional side of our logical science officer. Least Favorite Scene: Ah, I couldn’t pick a scene! Not that this movie’s immaculate, but I couldn’t pick a scene that stood out negatively! Well, that might just be it for 2015! It was a year that didn’t do too much for me, personally. Hopefully, 2016 is a more fun year, and I can blog a bit more! Merry Christmas, and if I don’t post again before the year’s out, Happy New Year! Gravity Falls Review, Season 1, Episode 7: "Double Dipper"
Scullyfied Simpsons: Season 9, Episode 22: "Trash of the Titans"
For all lawyers and content owners/creators that happen to stumble upon this blog, I own none of the content that’s reviewed here. I also own none of the screenshots, nor 99% of the images here. The reviews are protected under Fair Use – more specifically, Section 107 of the Copyright Act of 1976. I make no money off of this. I just do this as a hobby.